Before pilots had chronographs integrated into their wristwatches, they typically carried separate stopwatches for use in navigation. When the time-only wristwatch was eventually combined with a chronograph, pilots were able to satisfy both functions with one device. Fortis fuses these two primary functions in its Fortis B-42 Pilot Professional Chronograph from the company’s aviation collections, and what better movement to salute this match made in flight than the famed Valjoux 7750, the veritable workhorse of mechanical chronographs, which like the pilot watch, is renowned for its function-over-form simplicity. The Valjoux 7750 was introduced in 1974 and features prominently in contemporary chronographs. It differs from the traditional column-wheel chronograph in that it uses a different mechanism to control the switching functions, which include starting, stopping and resetting. The significant advantage of the 7750’s design is in efficiency, both in terms of ease of assembly and ease of maintenance. Fortis customizes the winding rotor of this Valjoux 7750 with blue engravings including the Fortis logo; the words Since 1912 Swiss commemorate the company’s founding year, while World’s First Manufacturer of Automatic Wristwatches commemorates one of the company’s finest achievements. All of this can be viewed through the watch’s exhibition caseback. To accommodate the movement’s three-plate construction (main plate, calendar plate and chronograph plate), the two-part stainless steel case is 42 mm in diameter by 16 mm thick. The sapphire crystal has an anti-reflective coating on both sides and the caseback is screw-down. The oversized, screw-down crown adds to the watch’s overall water resistance of 660 feet. The distinctive chronograph counter layout of the Valjoux 7750 has the 12-hour counter at 6 o’clock, the 30-minute counter at 12, and the continuous-seconds counter at 9. The chronograph hands, meanwhile, are painted orange so that elapsed seconds, minutes and hours can be calculated with relative ease. White numbers and indices provide excellent contrast against the matte, black dial. Plenty of Super-LumiNova coats the numerals, hour markers and hands. 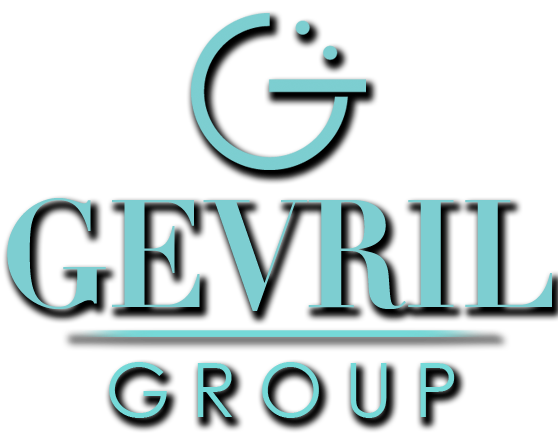 In addition to the traditional arrowhead index and flanking dots at 12 o’clock, two other arrows appear on either side of the day and date windows – one facing down and one facing up – to indicate which direction the wearer should turn the crown to make quick adjustments. The flange has a tachymeter scale for measuring speed in conjunction with the chronograph. 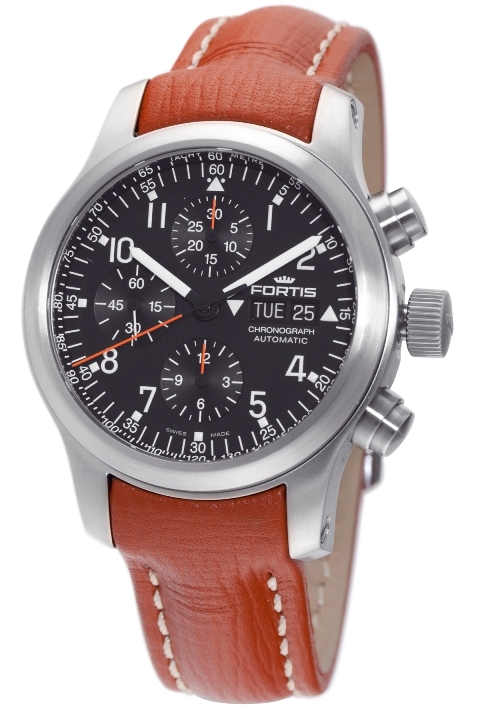 This Fortis B-42 Pilot Professional Chronograph features a padded cognac-brown leather strap with white stitching that brings the black, orange and white dial elements to the fore. 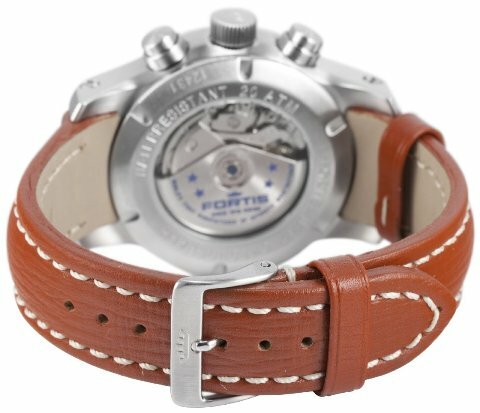 The strap is fitted to the case and the prong-style buckle is personalized with the Fortis crown. 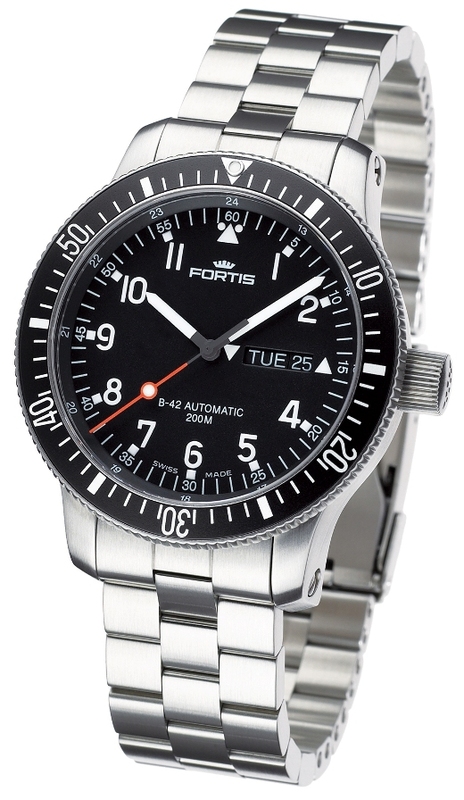 This Fortis B-42 Pilot Professional Chronograph may also custom labeled through the Fortis Squadron Watch and Fortis Private Label Watch Programs. There are two things that a pilot wants in an aviation timepiece: reliability and readability. With this in mind, most pilot watches feature large, oversize dials with legible, easy-to-read numbers. Pilot watches haven’t changed much since World War II however, with one major exception. Not surprisingly, it is Fortis who provides the exception. Fortis timepieces have been a favorite among pilots almost as long as there have been planes in the sky. With the introduction of the Fortis Spacematic Collection, aviators now have a thoroughly modern alternative to the traditional pilot’s watch. The bold, unisex design of the Spacematic GMT features one of most clearly legible and functional pilot dials ever produced. Easy-to-read white Arabic numerals are surrounded by 24-hour markings on a gray perimeter track. The 24-hour GMT hand is independently adjustable and there is a quickset bilingual date at 3 o’clock, a combination of features that even Rolex can’t offer. This 40mm stainless steel case is perfectly sized for your wrist. Both men and women can wear this watch with ease. The attractive cylindrical case design is a thoroughly modern update on the traditional pilot’s watch. With its signed screw-down crown, anti-reflective, sapphire crystal and optional exhibition back, this is definitely a watch that will get noticed. Like all Fortis timepieces, the Spacematic GMT isn’t just about looks however. The highly regarded 25 jewel ETA 2893-2 automatic movement is accurate to one second per day and the watch itself is water resistant to 200 meters. There is even a special diver’s extension available for the matching beadblast-finish stainless steel bracelet, if you prefer to take you watch underwater instead of up in the sky. The Spacematic GMT is eligible for the Fortis Squadron Watch Program. 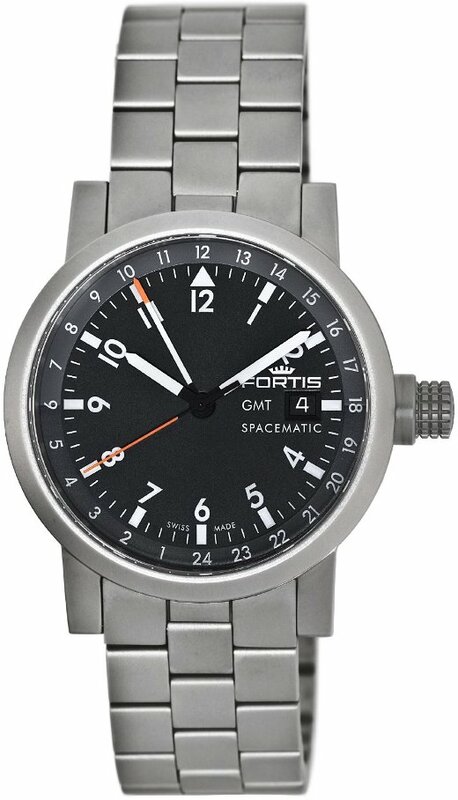 If you would like to have your own pilots and crew wear your squadron insignia with pride, Fortis will make a special edition of the Spacematic GMT with your squadron insignia on the dial just for you. Of course, you can always order the Spacematic GMT without a squadron insignia for yourself. If you are interested in acquiring one of these forward-looking and extremely functional watches, please contact an authorized Fortis dealer immediately and reserve your Spacematic GMT today. Crafted with high-quality materials, the Fortis Men’s Pilot Professional Automatic Black Dial Watch features a refined, circular dial with easy-to-read Arabic numeral hour indexes, a minute track, white hour and minute hands, and a red seconds hand. There’s also a convenient day of week and date display at 3. The sapphire crystal window protects the dial and features anti-reflective coating on both sides while a stainless steel case with a screw-down case back offers additional strength and durability. Ideal for active men, the timepiece has an Incabloc shock protection system and is water resistant to an impressive 660 feet. A polished, stainless steel bezel encircles the dial for an elegant look. Made from soft, calfskin leather, the black watch strap feels comfortable on and features white contrast stitching down the edges. This precise watch is equipped with automatic self-wind movement with 28,800 semi-vibrations per hour. 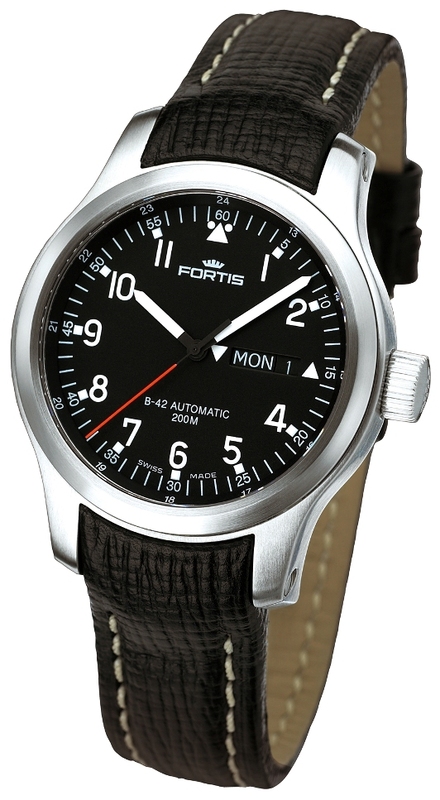 Your new Fortis B-42 Pilot Professional Black Dial Watch may qualify for squadron insignia customization through the Fortis Private Label Squadron Watches Program.